The new Winter Knitty is up!! Looked what I whipped up yesterday when I should have been working on the shawl! 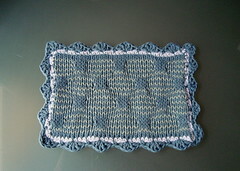 I felt the need for a little break, and I found this free pattern for a washcloth/dishcloth. I have a co-worker that is expecting a baby boy in the Fall, and I’m looking for something to make. I had this yarn in my stash (Lion Brand Cotton Ease), so I grabbed some size 6 needles and went at it. This was super easy and quick. I want to make another one, reversing the blue and sage colors to get a different effect. This version of the pattern requires a crocheted border, but it’s optional. 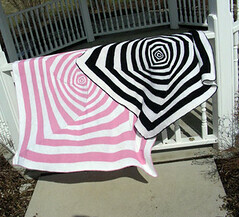 The overall size is 9.5″ x 6.5″ and is the smaller of the two that the pattern offers. A pile of these would make a great baby shower gift! Today I watched the funeral of Sen. Ted Kennedy and was quite moved. He was a man that gave so much for the cause of others, lived with such a purpose that all of us should adopt, and left a huge legacy for his heirs to be proud of. May God bless, strengthen and immobilize his family members he left behind to continue in his footsteps. 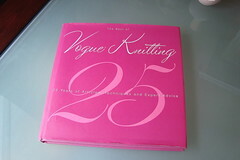 I received my winning book, “Vogue Knitting 25th Anniversary” from Nik! Thank you, again, I love this book. It is a great source of history, techniques and interviews from the greatest designers in the industry. It will remain on my desk in my knitting room, because I just can’t see it sitting on a shelf! 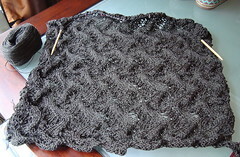 Progress on the ‘Meandering Vines’ shawl is going well. I have completed the fifth repeat out of seven for the first half, as this shawl is made in two pieces, and then grafted together. The pattern repeat is now memorized and flowing with more ease than in the beginning! I did go out and buy a longer (29-inch) cable needle to hold the stitches better, and have not had any ‘pop’ off the needles since. For the new knitters looking at this photo, I know the shawl appears wrinkly and the stitches indistinct…… this is because it has not yet been soaked and pinned down to dry (wet-blocked). In the previous post, I stretched it out before snapping the photo to show the stitch detail a little better. But stay tuned…..the beauty of this shawl is still yet to be revealed! 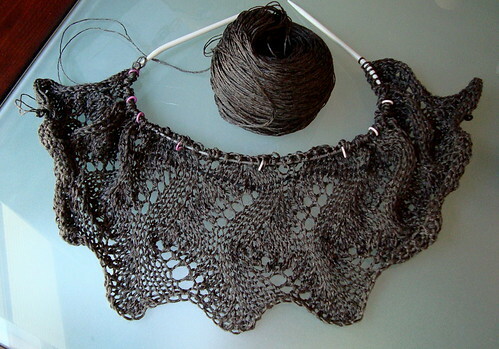 I’ve begun my next project: the Meandering Vines Shawl by Susanna IC. The pattern is free, but can only be found on Ravelry, the free members only knitting website. (So, go ahead and join! The pattern link can be found here.) This will be a gift for my niece that will soon be married. When my daughter got married, I made her a shawl and thought it would be a wonderful tradition to make each of my nieces a shawl as a wedding gift as well. Now mind you, I’m not the best lace knitter, but I love a challenge, and I thought this would give me the chance to hone those skills. Well, that was then, and this is now! I started this project five days ago and have already ripped out 50% of it due to a mistake! Ugh! So within the first 24 – row repeat, I have already learned the value of a ‘lifeline’ row, hence the now – present black yarn running through row 24. For my new knitters (last weekend I held a ‘learn to knit party’), if I have to rip out rows to reach a mistake, at least I know the pattern up to row 24 is correct, and the stitches are being held by the ‘lifeline’ yarn. If need be, those 100 stitches can be safely transferred onto a needle, once I’m finished with the ripping! At the end of the next 24 – row repeat, I can either add an additional ‘lifeline’ and have two of them or rip out the previous one and keep the newest one. 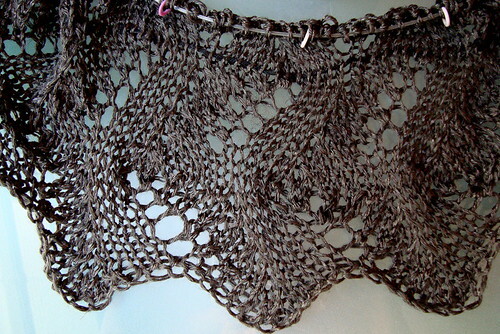 This technique is demonstrated with a video at knittinghelp.com under “Fixing Mistakes: Using a Lifeline” and illustrated at this website. The yarn, ‘Lino Chic’ by Elann.com, is 70% linen/30% viscose and it is VERY thin, almost like dental floss! So, I’m doubling the yarn and using a size 9 needle to give it an airy, more open look once it’s blocked. The yarn is very nice, but tricky, as it wants to ‘bounce’ off of the needles if you take your eyes off of it even for a minute! The cable on this set is 24″, so I probably could use at least a 32″ to eliminate this problem. While I love the results so far, this project had a very rocky start, and now it seems that I’m on a roll. Those of you who are expert lace knitters, keep your fingers crossed for me. The new Knitty.com Summer 2009 is up! For those of you who don’t know, this is a website that features FREE patterns. Check them out here. I hope everyone is finishing up on their Christmas preparations. I have finished my shopping and the only thing left to do is perhaps the most enjoyable – – baking! This weekend I plan to bake coffee cake loaves for holiday gifts. Soon, I hope to post a photo of my daughter modeling the V.Secret knock-off dress…. It’s time to vote on the new patterns to be available on Spring/Summer 2009 Drops Designs. Remember, you can only vote for 10 patterns. Have fun!